Situated on a natural platform overlooking the Menderes Valley, you will look out from Priene over long stretches of cotton fields and irrigation channels to the mountains, overlooking a gorgeous Turkish landscape that will no doubt stay with you long after you leave. Less visited than other sites near Kusadasi, Priene retains a great deal of its ancient Greek heritage, which you can explore here in relative solitude. 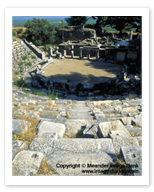 The ruins of many of temples built to the gods, a well-preserved theatre, and a stadium thought to be from the 4th century BC can still be appreciated, contributing to Priene’s reputation as the best-preserved of the Hellenic cities in Ionia, with little of the later Roman influence to be found here.